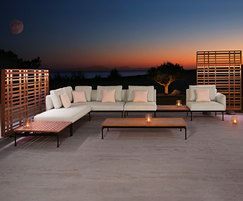 The Layout collection offers a large selection of contemporary designs, using a modular deep seating system that brings elegant indoor lounging to outdoor spaces. The collection is comprised of varying upholstered seat sizes and several tables which together create intimate or grand seating environments. The modular frame and tables are completely powder coated over 316 ‘marine grade’ stainless steel and are available in two colours: Forge Grey or Arctic White. Upholstered backs and arms are separate components, using the Sunbrella® Rain® waterproof fabrics. These can be attached on any side of the seats to create sofas, corner sectional, loungers, chairs, and many asymmetrical configurations. 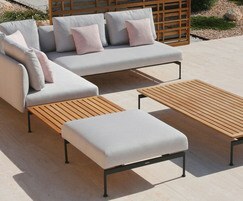 Layout is a creative kit of parts to build the perfect outdoor living room. Refined powder-coated frames support both the upholstered seats and the teak table tops that bring a warmer, more traditional appearance to this contemporary collection. Upholstered backs and arms are separate components. Can be attached on any side of the seats to create sofas, corner sectional, loungers, chairs, and many asymmetrical configurations. Choice of teak table tops.